It seems that every year or so, there is a new phrase to describe the way we are parenting our kids. Most of the terms tend to be less than flattering. Helicopter, Tiger Moms, Free Range Parenting, and Stealth Parenting are just a few being thrown around these days. Enter the newest term: Lawnmower Parents. 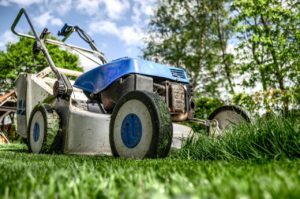 A Lawnmower Parent will go to any lengths to decrease the amount of pain their child experiences. They will “mow down” any obstacles that might get in the way. Instead of preparing their kids for challenges, they remove the obstacles that might cause pain, fear, anxiety or insecurity. Is this a real phenomenon? In my discussions with teachers and school counselors, I would say yes. It seems that children are becoming less resilient the more that we focus on their happiness. Yes, children have more challenges and stresses than ever before, but they seem to be less equipped to deal with those challenges. I think this tendency comes from empathy. We want our kids to thrive and be happy. When they are facing adversity, our empathy kicks in and we want to help them out of pain. But when we decrease the amount of struggle our kids face, we are not creating happier kids in the long run. We are creating an environment where kids will panic or shut down during moments of stress. In my work with parents, I have learned that parents can be great leaders by using three roles: The Supporter, The Consultant, and The Boss. The Supporter is there emotionally for your kids, cheering them on in their accomplishments and consoling during their struggles. The Consultant gives information in such a way that our kids will heed our advice and deal with situations a certain way. The Boss rewards and punishes. Did you notice what was missing? The Lawnmower. It’s missing because it is only sometimes beneficial to be The Lawnmower. Most of the time, when we rescue our kids, we squander an opportunity for our child to grow. Although it might help them get out of pain in the short term, it doesn’t give them the opportunity to learn how to solve the problem themselves. They don’t learn to solve problems in the moment and on their own. Instead of learning self-calming techniques, they instead panic and seek their parents to help solve their problems. Their confidence to solve problems decreases, which degrades their overall self-confidence. They will either over-externalize problems by blaming others or over-internalize problems by blaming themselves. Instead of viewing problems as something to solve, they become much more about a reflection of their self-esteem. How do we be good parents without heading straight to rescuing? Below is a format that might help. Example: Your 6th grade son just realized that a vocabulary test he thought was scheduled for Friday is actually tomorrow, Wednesday. He is in a panic. Spend a bit of time being The Supporter, letting your child know that you understand how difficult it must be. Try statements like: “You’re really worried about this.” Or “That’s a shock.” These types of statements allow your child to understand that you understand how hard the situation is. Avoid statements like: “You did this to yourself,” “You need to write down your assignments.” Placing blame at this point in the process is never helpful and doesn’t encourage problem-solving. Encourage problem solving. For instance, ask your child to come up with a number of solutions. “Let’s see how many ideas we can come up with on how to deal with this problem.” Write down all of them, even if they don’t seem helpful. Then identify the ones that are reasonable and that he can do on his own. Avoid the strong desire to solve the problem for him. It might be a simple task to call the teacher yourself and ask for an extension. It’s a quick solution that might work and will stop the panic your child is feeling, but it does nothing to teach problem solving and stress tolerance. If your child wants you to solve the problem, remind him that you have great confidence in him and that he has the bravery to solve this problem on his own. Debrief and Praise – After he has dealt with the problem, don’t forget to ask how it went and let him know how impressed you are that he solved this problem on his own. When we encourage our kids to solve their own problems, it increases their abilities in life, helps them deal with issues in the moment, and increases their confidence. It is difficult to watch our children in pain, but learning how to hold back, when the situation is appropriate, will pay great dividends in the future. Neil McNerney is a licensed professional counselor and author of Homework – A Parent’s Guide To Helping Out Without Freaking Out! and The Don’t Freak Out Guide for Parenting Kids with Asperger’s.